After partying with Banoffee Pies back in December, Emergency Room return with underground golden boy, Happa for another midweek throw down. Bursting on to the scene aged 14, Happa delivered a sound that encompassed all things UK. The unique combination of bass, techno and dubstep provided a new wave of dance music that caught the attention of the likes of Loefah, Four Tet and many more. Happa’s aggressive productions have seen him release on labels such as R&S, Bleep and Swamp 81. It is this aggressive style that we can’t wait to experience within the intimate setting that is The Pickle Factory. Joining Happa will be Emergency Room resident Dokter Zed. A versatile artist who will be bringing his trademark genre-bending style of DJ’ing. 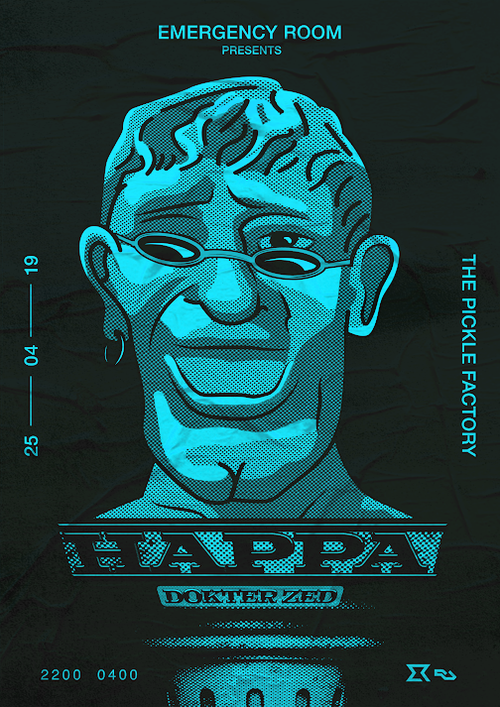 With recent productions being praised by the likes of Midland, Solid Blake, DJ Normal 4 and more, we’re excited to see what Dokter Zed brings to the party.